The stage was set at London’s Royal Festival Hall for Atomic Bomb! ‘David Byrne’s Meltdown’ was projected in large letters over the stage and there was no denying a buzz of anticipation in the air that mounted to cheering and whistling as the lights went down and the welcoming words ‘good evening London!’ got the night off to a heady start. But to really understand what this gig was about you had to be a David Byrne fan, as the majority of the audience seemed to be. 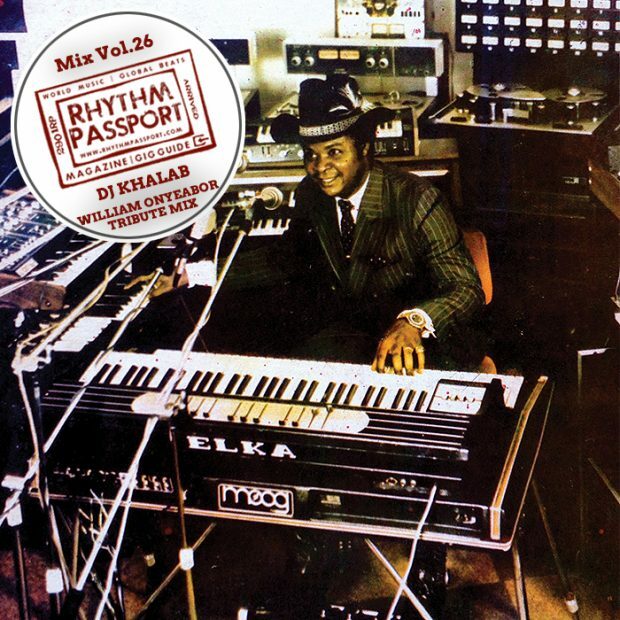 His label Luaka Bop ‘rediscovered’ and re-released some of the hugely popular music of the mysterious, eccentric and, some say, shady character of Moog disco king William Onyeabor, a man who produced several monster hits in his home country of Nigeria in the late 1970s and early ‘80s. He is now a reclusive church pastor. The band Atomic Bomb! is named after one of his iconic albums. What made William Onyeabor’s music so special was the fact that he was one of the few West African musicians with synthesisers, making him the one-and-only electronic Afrikan disco supremo from Enugu. The spontaneity of Onyeabor’s music with its simple, catchy lyrics and poppy electronic sound was translated into the modern western era by Atomic Bomb! with an unexpectedly dense sound, a huge band of between around eleven and twenty people on stage at any one time, plus a forest of music stands (which always makes my heart sink a little). The music began with some lyrical sax playing from Charles Lloyd, while the two drummers, talking drum player, percussionist, keyboards, bass, saxes, and guitarists gradually came out onto the stage creating a massive crescendo of sound. I was beginning to think the Festival Hall was the wrong venue for this groove-based music, but by the third number the entire audience was up on its feet while the white coated and behatted Alexis Taylor of Hot Chip sang the song ‘Good Name’. Meanwhile projected visuals appeared behind the band and Beastie Boys’ Money Mark pranced about playing the Moog. Even so, the sound lacked any analogue warmth until the Mahotella Queens arrived on stage for a few numbers. Then singer Ahmed Gallab of Sinkane appeared (the core band of the group), and for the first time in the evening there was a front man to focus the rather chaotic activity. Next came an Afrikan tribal vibe with talking drum and the Mahotella Queens dancing. Ahmed Gallab encouraged us to ‘get down to the floor’, and the audience was loving it and leaping about. David Byrne and the Mahotella Queens then left the stage and the hugely popular Malian duo Amadou & Mariam (though it seemed many in the audience didn’t know who they were) come on for ‘Better Change Your Mind’. A beat reminiscent of drum’n’bass and blaring moogs together created a dense texture with not a lot of detail. Relentless feedback spoiled their performance and although Amadou attempted a solo we couldn’t really hear his great guitar work. Then we got down to the Gospel songs for ‘When The Going Is Smooth And Good’ and ‘Bless My Soul’ with the biggest, whitest gospel choir I have ever seen (five or six black faces in a choir over one hundred-strong), and they weren’t really grooving either – but it looked impressive! So after the band introductions on ‘Higher Higher’ the evening drew to a close leaving me somewhat underwhelmed. From a musical perspective, the performances of individual musicians were swamped by the continuous thick texture. You didn’t get a sense of individual musicianship, mostly because you just couldn’t hear them in the wall of sound. With a roll call of famous names such as British trumpeter Byron Wallen and the several star vocalists that were present it was surprising that they weren’t made more of – too many cooks? Definitely. For a fan of West African music this project was a bit confusing. If I heard Atomic Bomb! and William Onyeabor separately without the lyrics I would have trouble connecting them. I struggled to see the link between Amadou & Mariam (from Mali), the South African Mahotella Queens and US-based Ahmed Gallab whose roots are in Sudan with the music of Willian Onyeobar. To reproduce a live version of the back catalogue of a musician from another era, musical culture and geographical location is challenging, an when the audience sees weird visual images of black mouths speaking through white masks, confusing – but each to his own! Despite my reservations the audience loved the night, and if their love of David Byrne’s enterprises brings them to explore more West African music then all the better.